Water Sports Books - Books on Sports - Sport Books: Catalog of books about your favorite sports. Major League Sports Books. Books on everything to do with professional and college sports. Buy books on your favorite sports here! 2019 Water Sports books on sale now. Buy your 2019 Water Sports books with us today. We have many Water Sports books to choose from and each purchase comes with the ease and convenience of Sportspool's online experience. We hope you find the Water Sports book that is perfect for you! "'Fit to Surf, a cutting-edge surfing-specific fitness guide, supplies surfers of all levels of experience with everything they need to create a personal fitness program that builds strength and endurance, increases balance and coordination, and minimizes the risk of injury. 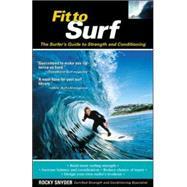 Personal trainer Rocky Snyder--himself an avid surfer with two decades of experience riding the waves--provides easy to-follow, step-by-step instructions supplemented with 60photographs of conditioning exercises that can be performed at home, in the gym, or on the water."